A commonly-used cancer drug can make patients' fingerprints disappear, potentially causing problems for foreign travel, a doctor warns. One patient was held by US immigration officials for four hours before they allowed him to enter the country. The case is highlighted in the journal Annals of Oncology. The patient's doctor, Eng-Huat Tan, from Singapore, advised all travellers to the US being treated with the drug capecitabine to carry a doctor's note. Dr Tan, based at the National Cancer Centre in Singapore, said several other patients had also reported loss of fingerprints on blog sites, with some also having problems entering the US. His patient, a 62-year-old man, had head and neck cancer that had spread, but which had responded well to chemotherapy. He was prescribed capecitabine to help prevent the cancer coming back. Although the drug is commonly used to treat a range of cancers, it can cause chronic inflammation of the palms or soles of the feet, leading to peeling, bleeding or blistering of the skin. Over time this can lead to the loss of fingerprints. Dr Tan's patient developed mild side effects, and because they did not affect his daily life, it was decided that he should keep on taking a low dose of the drug. In December 2008, after more than three years of capecitabine he travelled to the US to visit relatives. Dr Tan said: "He was detained at the airport customs for four hours because the immigration officers could not detect his fingerprints. "He was allowed to enter after the custom officers were satisfied that he was not a security threat. "He was advised to travel with a letter from his oncologist stating his condition and the treatment he was receiving to account for his lack of fingerprints to facilitate his entry in future." Foreign visitors have been asked to provide fingerprints at USA airports for several years. The images are matched with millions of visa holders to detect whether the new visa applicant has a visa under a different name. 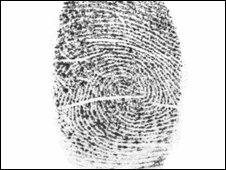 It is uncertain when a patient will lose their fingerprints, and in this case the patient was not aware that he had. Dr Tan said: "Patients taking long-term capecitabine may have problems with regards to fingerprint identification when they enter US ports or other countries that require fingerprint identification and should be warned about this. "It is possible that there may be a growing number of such patients. They should prepare adequately before travelling to avert inconvenience." Martin Ledwick, of the charity Cancer Research UK, said: "In a minority of cases, some chemotherapy drugs can cause hand and foot syndrome, where the skin can begin to peel on the palms of the hands and soles of the feet. "For most people, this is reasonably mild."